Click on the above image to view the long-term light curve of SS Cyg. 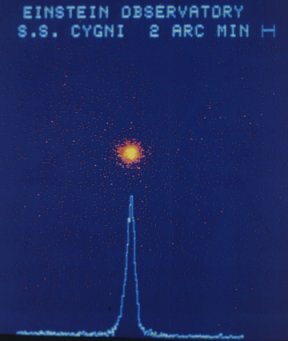 Since its discovery in 1896 by Louisa D. Wells of the Harvard College Observatory, SS Cygni has undoubtedly been one of the most observed variable stars in the night sky. In the past century of notoriety, not a single outburst of SS Cyg has been missed. In this time, nearly 220,000 observations submitted by AAVSO observers across the globe have contributed to the monitoring of some 800 outbursts. Being the brightest of the stars of its dwarf nova class, there is no doubt that SS Cyg is a favorite of many observers. The discovery "of a (variable) star in the constellation of Cygnus" was announced in Harvard College Observatory Circular No. 12 (November 12, 1896) by E.C. Pickering. A photographic range of 7.2 to 11.2, and a period of 40 days was given, which Mr. Pickering noted as "an unusually large range for a variable having so short a period." This new variable was assigned the name SS Cyg in 1897; a name that has become well known and revered in the astronomical community. The 1896 discovery of SS Cyg proved to be only the second star of the dwarf nova type, with U Gem being the first of the class with its discovery in 1855. (In stark contrast, today there are currently over 375 known dwarf novae.) In the Annual Report of the Director of Harvard College Observatory for the year ending September 30, 1896, Mr. Pickering states that "Five new variables have been found by Miss L.D. Wells from a comparison of chart plates. The most important of these is W Delphini, a star of Algol class..." (Hazen, 1997). Clearly SS Cyg's rise to fame was not predicted. SS Cygni in its low and high states, as taken with the Stamford Observatory 22-inch Maksutov telescope at f/3.7. Images courtesy of Charles Scovil. With many dilligent observers watching SS Cyg for well over a century, the tireless behavior of the variable has been well observed in the visual portion of the spectrum. SS Cyg typically remains in quiescence about 75% of the time. From this low state, the star then begins to brighten without warning, and reaches maximum light in just a day or so. The light curve of SS Cyg then shows a distribution of alternating wide and narrow outbursts which bear no specific cyclic pattern. Based on the AAVSO International Database, SS Cyg has a visual range of 12.2 at minimum to 8.3 at maximum. Recurrence can be expected every 4-10 weeks, with a duration of 1-2 weeks. SS Cyg, like all other cataclymic variables, consists of a close binary system. One of the components is a red dwarf-type star, cooler than our Sun, while the other is a white dwarf. Studies suggest that the stars in the SS Cyg system are separated (from surface to surface) by "only" 100,000 miles or less. In fact, the stars are so close that they complete their orbital revolution in slightly over 6 1/2 hours! Astronomically speaking, SS Cyg is also fairly close by, being a distance of 90 to 100 light years from its Earth-bound admirers (Burnham, 1978). The inclination of the system has been calculated to be about 50 degrees, yielding a respective component mass of Mwd = 0.60 solar mass and Mms = 0.40 solar mass (Honey, et al., 1989). SS Cyg's bright appearance, frequent outbursts, and location in the sky seem to be almost a recipe for a successful variable star! This enchanting variable is located in the constellation of Cygnus the Swan. The Cygnus constellation finder chart will help the first time observer locate the section of the sky in which SS Cyg can be found. Comparison star charts may then be used to make variable star estimates. For observers with small telescopes, this is a rewarding variable to watch since its range can be easily covered with such equipment. This star is cetainly a favorite of northern observers, especially those who find Cygnus to be a circumpolar constellation. Standing full 8.2 on the rostrum of the sky. Since SS Cyg's behavior is somewhat unpredictable, one observation per clear night is desired. However, the star should be observed several times a night when active, with the time noted to the minute. If you are unsure of the star's current activity, the AAVSO Quick Look files (which may now be access by the AAVSO Light Curve Generator) and the AAVSO News Flash will help to determine SS Cyg's present status. SS Cygni is a cataclysmic variable star, of the dwarf nova class. Such variables are comprised of a close binary system with a white dwarf primary star and a red dwarf secondary star, as mentioned above. Due to the evolution of the system, the main sequence star loses matter which is streamed in the direction of the primary, forming an accretion disk around the white dwarf star. The observed outbursts are believed to be the result of processes that arise in the hydrogen-rich disk. Whether the activity is the result of a sudden transfer of mass from the secondary to the primary (as postulated in the mass-transfer burst model), or if it is the product of instabilities within the disk (as prescribed by the disk-instability model) remains to be determined. (For a further review of this topic, see VSOTM SU UMa and RS Oph and references therein.) During this time, typical dwarf novae rise by 2-6 magnitudes on a timescale of 10-1000 days. One of the signifying features of dwarf nova light curves is that each outburst does not necessarily look like the others. That is, the shape of the outburst may change from cycle to cycle. A look at SS Cyg's light curve reveals ever-changing intervals of wide and narrow outbursts, of about 18 and 8-day durations, respectively. In addition, we also see the occasional anomalous outburst, which are typically rare in frequency, wide and symmetrical in shape, and occur with a slow rise rate. Although the star has typically displayed this changing outburst characteristic since its discovery, SS Cyg underwent a period of "confusion" between 1907 and 1908 when it ceased to exhibit its normal outburst behavior and only underwent minor fluctuations. After this time, such behavior has not been observed again. "SS Cygni still remains one of the greatest enigmas in variable star astronomy, and continuous observations throughout its entire light curve are essential to the final solution of the problem presented." -Leon Campbell, Annals of Harvard College Observatory Volume 90, No. 3. After an extensive study of SS Cygni's light curve, Leon Campbell (1934) concluded that the outbursts could be classified by a letter sequence depending on their rise and decay times: class A with a rapid rise to maximum; class B with a slightly slower rise; class C with a moderate rise; and class D with an exceedingly slow rise. The C and D classifications are referred to as anomalous in comparison with the rapidly rising of the A and B types. The A and B outbursts, however, are then classified into wide and narrow in nature. Further investigation showed the A class as the leader with 64% of the outbursts being of this type, B with 9%, C with 18%, and D with 9%. A later study by Bath and van Paradijs (1983) refined the definitions of classes such that type A outbursts generally begin from a quiescent state of visual magnitude of 11.9 +/- 0.12, while the others brighten from 11.64 +/- 0.30. Statistical studies of SS Cygni's light curve over the years have revelaed numerous correlations (Sterne and Campbell, 1934; Bath and van Paradijs, 1983), one of which being the preference of wide and narrow outbursts occurring in an alternating pattern. An investigation of the long-term behavior of SS Cyg was carried out by Cannizzo and Mattei in 1992 concerning the outburst type. In this publication, an outburst is said to occur when the variable exceeds a visual magnitude of 10. The outbursts are then separated by timescale according to long, or wide, outbursts (denoted by the letter "L") with a duration exceeding 12 days, while the short, or narrow, outbursts (denoted by the letter "S") consist of less than 12 day duration. A study of the data yielded the most common sequence as LS (with 134 occurrences), LLS (69), LSSS (14), and LLSS (8). Together these strings represented 89% of the outburst studied. Cannizzo (1993) has suggested that the determining factor as to whether an outburst will be a wide or narrow episode depends upon the amount of mass in the disk at the start of a thermal instability. That is, the narrow outburst may correspond to moderate mass transfer, while wide outbursts may be inspired by a major mass transfer. For a further review of this subject, see the paper by Smak listed below. A portion of the SS Cygni light curve from the AAVSO International Database displaying interchanging bouts of wide and narrow outbursts. It seems that SS Cyg is always at the forefront of breaking new ground. Its involvement in the very first AAVSO Alert Notice, published on June 11, 1974, is no exception. The X-ray flux from SS Cygni, as detected by the EINSTEIN satellite. The observational plea sent out worldwide was an "URGENT REQUEST" for visual observations to assist, the then, forthcoming radio observations for astronomers at the David Dunlap Observatory. Since that time, SS Cyg has been the subject of 50 Alert Notices, in which visual observations have been requested of AAVSO observers to correlate with X-ray, ultraviolet, infrared, and radio observations. Assisted satellites include a various number of NASA and European Space Agency missions, such as Apollo-Soyuz, HEAO-1, HEAO-2 (EINSTEIN), ANS, Ariel V, IUE, Voyager, IRAS, EXOSAT, ASCA, ROSAT, HST, EUVE, BEPPOSAX, and RXTE. Why such an intense interest in multi-wavelength coverage? Theory has suggested that the light we see in the visual portion of the spectrum during outburst arises from the cooler, outer-most region of the accretion disk. The inner disk, however, is hotter as a result of the liberated accretion energy, and is the source for ultraviolet emission. 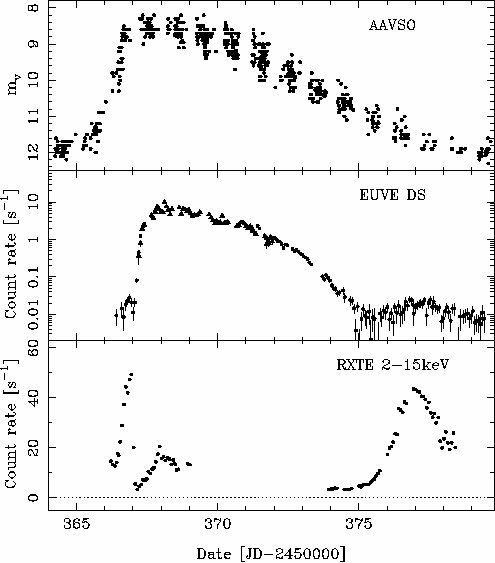 The boundary layer between the accretion disk and the white dwarf is even hotter, and as a result emits X-ray and extreme-ultraviolet radition. Thus, in order to investigate the properties of the inner regions of the disk and the boundary layer of SS Cyg, as well as other dwarf nova-type stars, it requires observations with satellites that have instruments that can observe in high-energy bands. Why choose SS Cygni for such observations? There are three reasons why SS Cyg is a favored CV for multi-wavelength obsevations: (1) it is bright, (2) it is nearby, and (3) because of low hydrogen column density, ie, a low number of hydrogen particle/cm2 between us and SS Cyg. With continued observations throughout the spectrum, we will be able to learn more about this fascinating variable. Since SS Cyg's outbursts occur unpredictably, professional astronomers rely of the eyes and instruments of amateur astronomers to help pinpoint the start of an outburst. Thanks to all the AAVSO observers who have spent countless hours heeding the call for observations! Cartoon modified by Daniel Costanzo 4/79. Your Hawaiian observer, Bill Albrecht, called to say that at JD 2450365.779 SS Cyg had reached 10.9, so he said he was positive it was going to go up. He went so far as to say that he would put money on it. So, I called Pete, who'll contact XTE and eventually SAX...Anyway, sounds like we're all set. I hope Bill is right - maybe he's been drinking too much hard pineapple juice! Chris phoned me at 0700 UT with the news from Hawaii. I got onto XTE and triggered the satellite straightaway. They have an advertised response time of seven hours, so it's possible we'll get onto SS Cyg with 11 hours of the first observer calling Janet. That would be great...I was so excited at the news that I fell off my bike on the way to work - and I'm sitting here covered in cuts and bruises. It's a dangerous business we're engaged in. As a result of this enthusiastic amateur-professional collaboration, the October 1996 outburst of SS Cyg was observed simultaneously for 12 days in the visual, ultraviolet, and X-ray band passes. In light of this excitement, Dr. Mattei will be presenting the results of this unique and important multi-wavelength observing run at the American Astronomical Society meeting in Rochester, NY, June 4-8, 2000! Impressed by the success of the project and to provide more opportunities for amateur astronomers, the director of EUVE granted three day's of observing time of with EUVE to the AAVSO to use on any star of choice! Thanks again to AAVSO observers! The narrow October 1996 outburst of SS Cygni provided astronomers with more clues about the nature of dwarf nova outbursts. For more information about the SS Cyg collaboration, visit RXTE's Greates Hits and EUVE Science Highlights. In the summer of 2000, SS Cyg will be observed by the Chandra X-Ray Observatory and EUVE with hopes to learn even more about this fascinating variable. Be sure to keep an eye out for AAVSO Alert Notices and AAVSO News Flashes for requested monitorings! As an interesting sidenote, the AAVSO has a special tie to this satellite. AAVSO member and observer Gary Emerson worked as a test engineer at Ball Aerospace on Chandra's Charge Coupled Device (CCD) camera. Bath, G.T., and van Paradijs, J. "Outburst Period-Energy Relations in Cataclysmic Novae." Nature, 305, 1983, 33-36. Burnham, Robert Jr. Burnham's Celestial Handbook (3 volumes). New York: Dover, 1978. Campbell, L. "The Light Curve of SS Cygni, 213843." Annals of the Observatory of Harvard College, 90, 1934, 93. Cannizzo, John K., and Janet A. Mattei "A Study of the Outbursts in SS Cygni." The Astrophysical Journal, 505, 1998, 344-351. Cannizzo, John K. "The Accretion Disk Limit Cycle Model: Toward an Understanding of the Long-Term Behavior of SS Cygni." The Astrophysical Journal, 419, 1993, 318-336. Cannizzo, John K., and Janet A. Mattei "On the Long-Term Behavior of SS Cygni." The Astrophysical Journal, 401, 1992, 642-653. Hack, Margherita, and Constanze la Dous, eds. Cataclysmic Variables and Related Objects. Washington, DC: NASA Scientific and Technical Information Branch, 1993. Hazen, Martha L. "The Centennial of the Discovery of SS Cygni." Journ. AAVSO, 26, 1997, 59-61. Hempelmann, A., and J. Kurths "Dynamics of the Outburst Series of SS Cygni." Astronomy and Astrophysics, 232, 1990, 356-366. Hempelmann, Alexander, and J�rgen Kurths "Mass Transfer Rate and Outburst Cycle of SS Cygni." The Astrophysical Journal, 412, 1993, L41-L42. Honey, W.B., G.T. Bath, P.A. Charles, et al. "Quiescent and Outburst Photometry of the Dwarf Nova SS Cygni." Monthly Notice of the Royal Astronomical Society, 236, 1989, 727-734. Mattei, Janet A. "SS Cygni." Journ. AAVSO, 3.2, 1974, 43-48. Mauche, Christopher W. has webpage where he gives an excellent review of cataclysmic variables. Dr. Mauche also has a page devoted to his publications about SS Cygni and other related topics. Smak, J. "Dwarf Nova Outbursts. II. On the Nature of "Narrow" and "Wide" Outbursts." Acta Astronomica, 49, 1999, 383-389. Sterne, T. E., and L. Campbell "Properties of the Light Curve of SS Cygni." Annals of the Observatory of Harvard College, 90, 1934, 189. Szkody, Paula A., and Janet A. Mattei "Analysis of the AAVSO Light Curves of 21 Dwarf Novae." Publcations of the Astronomical Society of the Pacific, 96, 1984, 988-995. Warner, Brian. Cataclysmic Variable Stars. New York: Cambridge UP, 1995. ISBN 0-521-41231-5. This month's Variable Star of the Month was prepared by Kerri Malatesta, AAVSO Technical Assistant.